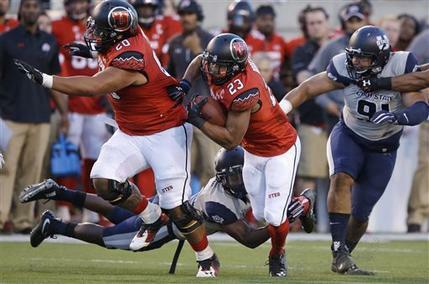 SALT LAKE CITY (AP) — Utah entered the season with a star running back, a staunch defense and a pair of dependable kickers. The need was consistent, efficient play at quarterback. The No. 24 Utes got exactly that from senior starter Travis Wilson – for five quarters. Devontae Booker ran for 120 yards and a touchdown and the Utes beat Utah State 24-14 on Friday night in a victory marred by Wilson’s left shoulder injury. “That’s the nature of the game,” Utah coach Kyle Whittingham said. “A guy goes down and the next guy’s got to step up. I asked Kendal to just move the football team and take care of the football. The Utes (2-0) lost Wilson in the second quarter. He returned to the sideline with ice on his non-throwing shoulder and his arm in a sling. He was injured at the end of a 38-yard run that set up Booker’s touchdown that gave Utah a 14-7 lead. Utah defensive lineman Hunter Dimick also went down with a leg injury in the second quarter. He earned a Pac-12 honorable mention in 2014 after posting 10 sacks and is one of the leaders of the defense. Whittingham wouldn’t give specifics about the injuries, but said neither was season-ending. Kendal Thompson replaced Wilson and threw for 56 yards and ran for 23 and a touchdown. He made two starts in 2014 and had replaced an erratic Wilson before he went down for the season with a knee injury. The competition to start was open in the fall, but Thompson couldn’t surpass Wilson. Chuckie Keeton passed for 256 yards and two touchdowns and also threw two interceptions for Utah State (1-1). He ran for 46 yards. Keeton tied the Utah State career touchdown passes record with a 15-yarder to Zach Van Leeuwen. Jose Fuentes set the record in 2002. Nick Vigil and LT Filiaga tied for a Utah State-high 12 tackles. 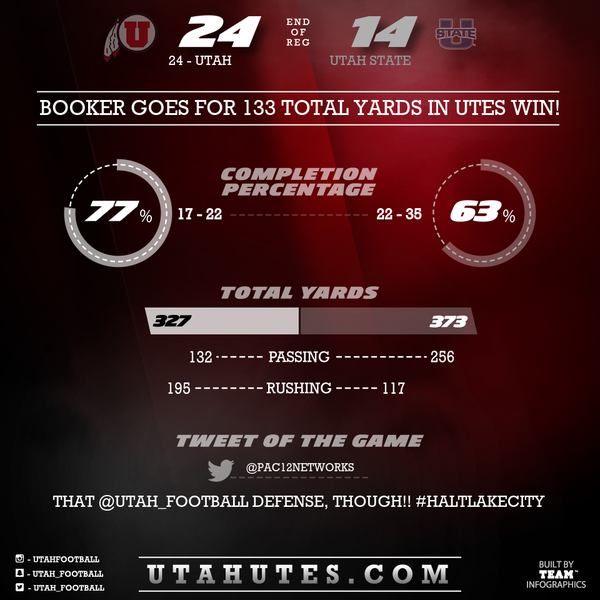 The Utes rode Booker with 31 rushes as the team finished with 195 yards on the ground on 44 touches. Wilson gave Utah its first points with a 12-yard run to the pylon, including a leap over a defender. Utah only threw 22 passes, but diminutive receiver Britain Covey continued to shine in his second career game. The 5-foot-8, 166-pounder led the Utes with six catches for 61 yards and added a 30-yard punt return. Covey has proven to be one of Utah’s most exciting players through two games, making a defender miss almost every time he touches the ball. His punt return had fans jumping out of their seats. Jared Norris led the Utes with 10 tackles as the unit ended any Utah State hopes of a comeback by forcing a fumble and an interception on the Aggies’ first two fourth-quarter drives. Safety Marcus Williams picked off his second pass in two games and Gionni Paul had seven tackles, one for los, a fumble recovery and an interception. Still, Whittingham was disappointed with its play against a team that failed to score an offensive touchdown in the opener against Southern Utah. Utah travels to face Fresno State for its first road game next week. Utah State also hits the road to play Washington.